Foristell, MO - Mittler Bros. has been a leader in the circle track hub and drive flange arena for over 15 years. We have taken all our knowledge and manufacturing skills and used it to design and build our Off-Road 5” x 5-1/2” bolt circle hubs and matching 40 spline drive flanges. The hubs are made from a proprietary alloy steel forgings and CNC machined to exacting tolerances. This alloy makes for a very ductile but TOUGH hub. The companion 40 spline drive flanges are heat treated alloy steel. Our customers refer to both of these items as “Bullet Proof”. Our rotor adapter ring prevents hub damage when there is an accident and rotor damage occurs. Complete kits as well as individual replacement parts are available. 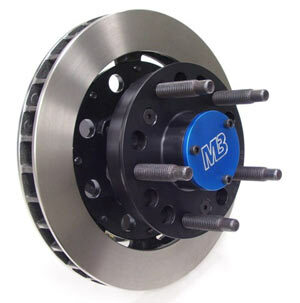 Kits include; hubs, drive plates, bearings, races, seals, dust caps, nuts, washers & o-rings. Individual spindle snouts are available for custom fabrication of housings and front spindles. For information call (800)-467-2464 or log onto www.mittlerbros.com.